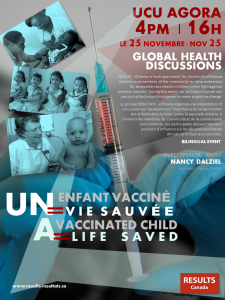 The RESULTS uOttawa group is hosting an event for University of Ottawa students and members of the community to raise awareness for accessible vaccines for children, in the fight against extreme poverty. During the event, we will learn how we can use our collective political power to make a positive change. The event is bilingual.